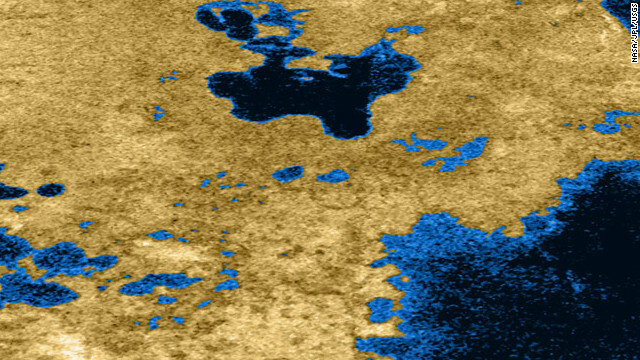 NASA's Cassini spacecraft delivered images suggesting that Titan has lakes. While the rover Curiosity is driving almost flawlessly on Mars, scientists are proposing another exciting possibility for extraterrestrial exploration: a probe that would sail across a lake on Saturn's largest moon, Titan. SENER, a private engineering and technology group, is partnering with Spain’s Centro de Astrobiología to propose the Titan Lake In-situ Sampling Propeller Explorer (PDF), TALISE for short. "Talise" is the Iroquois word for "beautiful water." TALISE is a boat probe that would navigate Ligeia Mare, a large lake on Titan, making extensive scientific analyses during the journey. Scientists involved say the mission would be broken up into three phases and last six months to a year. “The principle objective shall be to characterize Titan’s environment, lakes and its terrain’s chemical composition, rich in hydrocarbons and nitrogen,” the scientists wrote in an abstract presented at the European Planetary Science Congress in September. For now, it's just a concept. And it would not be the first attempt to explore Titan. In the 2000s, NASA’s Cassini-Huygens mission found many bodies of liquid hydrocarbons (similar to household gases) on the moon and possibly a layer of liquid water under its shell. TALISE will pick up where Cassini-Huygens left off. The major difference would be an advanced propulsion system to make it stay afloat longer, allowing it to gather more information. Scientists have thought about several options for accomplishing this, including paddle wheels, inflatable wheels, tank wheels, and air or liquid propeller. Most fascination associated with Titan comes from its Earth-like features. Its organic chemistry, thick atmosphere and vast rivers may provide evidence about the beginnings of life because it mirrors what Earth looked like billions of years ago, before humanity began breathing oxygen. But it's too cold for life to exist now - at least, life that subsists under conditions we know on Earth. If the TALISE mission is approved, it will be the first to analyze liquid across Titan’s large northern region. The mission also plans to study terrain surrounding Ligeia Mare. “It will open the doors for a new generation of small landers with longer lifetimes, cost-effective and equipped with state-of-the-art in-situ (in-place) instrumentation,” Urdampilleta said. CNN's Elizabeth Landau contributed to this report. Thank you , thank you.. I'll be here all night..
Don't forget to tip your waitress..
As a former English teacher I wish I'd been able to use these comments as a teaching tool: few of the commenters really understand the difference between its and it's. It's means it is. Proofreading doesn't seem to be a talent of far too many who feel compelled to share their thoughts. As a former student of a (probably) former English teacher – I wish some people would stay on topic and post comments relevant to the article with which they are associated. Its a stupid internet blog....relax. This sounds exciting but, isn't Spain on the verge of financial collapse? Either their fiscal condition has been grossly exagerated or these guys shouldn't be trusted with a checkbook. Maybe the Spanish can convince the Pope to set a demarcation line at the asteroid belt granting the Spanish government rights over everything outside the asteroid belt. The last time they did that it worked so well. Did you hear? the new fall line of foil hats are out, go check it out. We are going to provoke the ire of Thanos. I think he's learned his lesson.. plus, I don't think he has access to the infinity gems anymore..
One thing not mention anymore on these fantastic endeavors is how do they protect the host environment from contamination coming from Earth? Do they irradiate the vehicles? I always wonder about that, I hope so. I'm pretty sure the sun along with other sources of extra-stellar radiation would take care of any living matter contained on-board. Also, even if we did somehow contaminate the atmosphere with possible living microbes, it would be quite a long time before we realized it. In fact, it's a pretty popular theory on how life on our own planet started. It's called panspermia. Life through extraterrestrial seeding (whether by designed or natural vehicle). "it mirrors what Earth looked like billions of years ago, before humanity began breathing oxygen." So, humans were here billions of years ago and we didn't breathe oxygen at first? How about...."billions of years ago, before ANYTHING began breathing oxygen." I did a double take on that too. I don't know what the author was thinking. Would the boat be named Saturantic which woulod eventually sink when striking an Martin ice-berg? Wootings, Steve said "Martin" iceberg (not Martian). Obviously he is Steve Martin and still trying to be funny. You never know, maybe he will have an iceberg named after him. this is a crazy cool concept! Who would have thought it would have been a fish finder prompting our migration to space? This is very neat stuff. I designed my own space mission but I'm keeping the details under my hat - for now. Same goes for my new Spring fashion line. See you at Fashion Week. First of all, the Huygens lander from the Cassini mission didn't land in liquid and sink. It landed on the "ground" (ice) and took photos of the surface showing rocks laying around the area. Why can't so-called "science writers" get the facts straight just for once??? Secondly, it's thought that the liquid in the "lakes" is more like thick oil or soft tar. I don't think a "boat" would do very well. I thought it actually landed in "mud" ? Plus, the possibility that it could touch down in an "ocean" was in fact taken into account with its design. I'm not sure that we should be sending things from our planet to a moon which could possibly develop life. Even if bacteria couldn't or didn't survive inside, we might introduce a foreign element/chemical/etc. that could alter the moon's environment. This reminds me of the idea of asteroid mining- knock the wrong one off course and take out a city. I respect your point but it seems a bit short sighted. If you don’t go anywhere because you might change it…you might as well never leave your house. The very nature of exploration involves risk. The possibility that we could stop or change the development of life on a planet/moon that might develop life seems a bit alarmist. Maybe so. I'm all for space exploration. I think we should start building on Mars. I just think we should be careful sending things out into space without considering the possible consequences. Tom tom said something intelligent for once? ... what about the nebula that is coming right for us to destroy the entire planet anyways? Should we not discover food just because it may poison us? By the immature and poorly knowledged nature of many of the posts, one could infer that the international scientific community will outmatch the U.S. in practical space exploration within a generation or so, as it seems that the U.S. will soon find slim pickings among it's native population for intellectual talent...oh wait...NASA HAS been using it's share of imported talent since Freiherr von Braun and part of his Peenemünde staff got inducted in 1957, my bad. If you would infer a nation's intelligence from a handful of internet posts, that shows your lack of scientific knowledge. The fact that you end your post with "my bad" is evidence that no matter how condescendingly narcissistic you are, I have a feeling NASA won't be sending you a request for your services either. Please read past the first sentence before commenting. It clearly says this is NOT funded by NASA, but by a private firm in Spain. Believe it or not, there are other countries in the world with scientists. And not a penny of your tax dollars will be used for this. Get a grip. Just want to point out that SENER has offices in America, so you could technically say indirectly tax dollars are used because businesses necessarily use public infrastructure. i have a funny feeling that OUR generation will be long gone before anything is really discovered...but who knows....I might be wrong. And I have 1 question for you – Why the helll are you commenting here if yoou didn't even read the freaking story? The second sentence reads, "SENER, a private engineering and technology group, is partnering with Spain’s Centro de Astrobiología"
"Principal" objective is the correct spelling, CNN. No it isn't. Principle is is correct. Principle is the descriptor that identifies an article as 'most important'. Principal is the head of your kid's school. Hi, "principle" is the spelling used by the authors in the abstract that they presented – this is a direct quote. Homie Slice- One place you should go is back to school and at least try to complete the 6th grade. Just be careful you don't fall off the edge of the flat earth getting there. You need to check out the "Flat earth Society" website. It's president is a firm believer in the evolution, million of years story. He's in your camp - so quit throwing stones at people who are not believers in "Almighty Chance". Sorry, but anyone who believes the earth is flat and the continents are surrounded on all sides by Antarctica is as oblivious as someone who believes it is 6,000 years old. We couldn't have been breathing anything other than oxygen a billion years ago because the earth and everything isn't older than about 9,000 years? It must be hell and we shouldn't go there. You need an education. Leave your fairy tales at the the door. Is it true there is a ring around Uranus? No – but there are rings around Uranus. Uranus has several rings around it from hard penetrating objects constantly making contact. Shouldn't you guys be doing homework or something instead of spewing stuff out I heard in my sixth grade science class? The ship should also have a few extra probes that can separate before splashing down which can be sent out to different parts of the moon and communicate back to the ship with it's findings. One or two of them can attempt to break through the ice to see if it can make it to the liquid water and confirm what it finds there. Being liquid doesn't necessarily mean it's water. Actually the article mentions there may be liquid water under the shell. Before you jump down someones throat read the whole article. Posted below is the relevant quote. "NASA’s Cassini-Huygens mission found many bodies of liquid hydrocarbons (similar to household gases) on the moon and possibly a layer of liquid water under its shell. " was the earth once a moon of saturn? Do you have autism or something? Why not send a ship there that can convert the liquid hydrocarbons to energy? It will be able to power itself pretty much forever. I don't think there is enough O2 there. Otherwise, the place would be in flames already. gettin way ahead of yourself there buddy. Let's just start with a teleprescient robot and do some recon. Spaniards; always looking for new worlds to explore and exploit. Ummm......oh, never mind. It's hopeless. My favorite comment of the night. Joint effort among nations? Gimme a break. The rivers and lakes of this moon are flowing with HYDROCARBONS, like methane (natural gas). This is an energy source, and it's the energy companies that want to survey this moon AT OUR EXPENSE. Ultimately, they would want to TRANSPORT the hydrocarbons to planet earth and sell them to us. The public sector would fund all the research, and who would get the profits? Just so we're clear, you realize that we're decades, if not centuries away from having tech that can not only reach a foreign planet, but also make it back, let alone load up cargo alongside it. Either you're trolling or you're an idiot. There is something that everyone has forgotten to mention. NASA will be supporting this. EVRYTIME someone wants to launch into space you have to contact NASA, because they know where all the satellite are. The satellites for television, weather, and communications. There are more. NASA also knows where all the space junk is. This is why ANYONE who lauches has to contact them first, because this is why NASA says there is a small window of oportunity to launch. Oh, and yes, I did read theentire article before I posted this comment. Yes, an effort as large as sending a probe to a whole other world millions of miles away might require more than one country working together. What's your point? you go spain. take the lead. dont let america tell you how to spend your money. If the countries of this planet can share the expenses, technology, data and everything else that makes these types of missions possible, we could easily afford more exciting adventures within out solar system and maybe into deep space. A joint effort between the nations would be a dream come true. It would take a hell of a reason to convince them though. Maybe once the economy gets back on track, we can get our hands dirty and make something big. "Its organic chemistry, thick atmosphere and vast rivers may provide evidence about the beginnings of life because it mirrors what Earth looked like billions of years ago, before humanity began breathing oxygen." Humanity wasn't around BILLIONS of years ago. It wasn't? Where was it then, if not around? Before humanity breathed oxygen "we" were one celled bacteria and didn't breath anything. This was a very long time before humanity existed. There are a lot of problems with that sentence. I think back than the planet probably smelled like $h1t with all the gases mixing, we just sat there and held our breaths for a very long time! More CNN quality science reporting: "...it mirrors what Earth looked like billions of years ago, before humanity began breathing oxygen." Say what? Exactly what humanity was around billions of years ago, and what did those humans breathe? My third grader would fail his science class if he handed in garbage like this. Just to help you out .. the clue was "before humanity .. ". That also means they weren't here yet to breathe anything. I think CNN is safe on your critique. Perhaps, but if the abstract really said "principle objective" and not "principal objective" then the scientists need a better editor. Just to help YOU out, the line was "Before humanity began breathing oxygen", not just "Before humanity". This indicates the writer's belief that humans were around, just not breathing oxygen at the time. Wow, how many people here even bothered to read the article that says this project is being put together in Spain and supported by a private firm? Where does it say that US tax dollars are involved? Nowhere. Yet people here think the US is spending another pile of our tax dollars on a probe that will sail on another planet. No wonder our country is ranked 25th in education compared to the rest of the world. We can't even read a simple CNN article. Sorry, but there won't be no funding for this project, the money will be used to invade Iran, cause America needs a new war per decade. This isn't a NASA project. You should read the articles before commenting. I agree with you that reading is fundamental, this guy is just a troll. I doubt he got past the headline in his rush to post something stupid and inflammatory to make up for all that attention he lacks in other areas of his life. But, even a broken clock is right twice a day. ESA budgets are under as much pressure as NASA's and even more complicated . The only way this thing has a chance of going forward is to get Germany and/or France onboard with the idea, because they're going to be putting up most of the money. And it's just as likely that either of those nations would prefer to have NASA involved, if they could find room in their budget for it NASA's rover expertise is rather extraordinary. It would certainly calm the investors. "won't be no" is a double negative. You should not say "no funding" in front of "there will not be (won't be)". This implies that you actually mean that there will be funding. SENER, A PRIVATE ENGINEERING AND TECHNOLOGY GROUP, IS PARTNERING WITH SPAIN'S CENTRO DE ASTROBIOLOGIA. Where in that sentence does it state the US is funding anything? Oh that's right people like you don't read past one paragraph. NASA wasn't even going to send a camera with the last Mars lander. They don't care about data gathering and science, just finding ways to spend their budget and justify an even larger budget next year. "askew" – Your post was a classic.. thanks for the laugh..
Are you just an idiot or a troll? Maybe both? NASA's paid back it's budget tenfold in technology and discoveries. And a quick reminder" less than half a penny of every tax dollar is in NASA's budget. This is not a NASA project. You should read the piece before commenting. What kind of expert are you to question NASA?, apparently one that likes pictures.Nowhere does it say this project is being funded by nasa. Your ignorance is blinding, you do not know the potential of what may lie upon the final frontier. And by the way "the science" is so complex to understand it you need to devote your life to it's pursuit and expect nothing in return other than to get sh_t on by _ssholes like you. First of all, the last time NASA had a budget increase was 2009. It's been reduced every year since. And that year it was less than one half of one percent of the federal government's expenditures. Secondly, a regular camera *is* kind of a waste of space and money. Any data it gathers from the visual spectrum can be collected just as easily (and often more accurately) by other instruments. But what those other instruments can't do is generate the big, artsy panoramas that folks like to look at. And finally, if you can't even gather the notion that this is a mission that ESA (European Space Agency) is considering, when that information is clearly and explicitly stated to you in this article, then I'm not sure why anyone should trust your opinions in the rest of your comment. People like you are the main reason I am so terribly saddened by budget cuts to public schools. You are barely capable of functioning in the real world, yet the future of the entire human race depends upon your support for things which you are incapable of understanding. Right now is the time to spend billions of tax dollars on a sailboat for some moon that we won't be on for over five hundred years. That's a great investment. Lets cure cancer, hunger, radical islam and stupidity first. You can start with your own stupidity. If only there was a like x 1,000 button. HAHAHA! You should probably read the story before commenting. It's an engineering firm and a scientific research center in SPAIN. Your tax dollars have very little to do with it. Every second of every day, your life is affected by technology that was developed or refined by NASA. These devices and ideas aren't whimsical or wasteful. From MRIs and heart pumps to plane de-icers, safer tires and better roads, the equipment that firefighters carry (and that keeps them safe), memory foam pillows, better baby food and freeze dried perishables, advanced testing systems for aerospace components... the list goes on and on. Since 1976, more than 1600 technical innovations have been generated through NASA's research, or through NASA's assistance in outside research projects. All with a budget that has never once in NASA's history exceeded 1% of the total for federal spending. "Go ahead and get snippy, baby. If you knew the science maybe I'd listen to a word you're saying." You seem to think nobody else can fathom or understand the benefits of new technologies. We can. You seem to think everyone who disagree with these particular types of projects are Luddites who want everyone living in caves and riding horses. We don't. You also seem convinced that no other form of scientific endeavor produces any results of value. They do. Science will continue it's march to improve our understanding of the Universe and to improve the quality of life without sending a boat to Saturn's moon. There is a huge percentage of people who think we have more pressing problems. It's like this: Would you spend your whole paycheck working on a Theoretical Problem when your wife and kids don't have enough food to eat? 'Cause there's a whole lot of people on this planet who don't. That's what we are saying. Let's look at your specific claims. NASA's contributions to the medical field have allowed cancer patients to survive longer, allowed doctors to study the diseases in more detail, and because of that many types of cancer are survivable today when they would have been a death sentence not many years ago. Hunger .... NASA's developments have resulted in better packaging and better transporting for foodstuffs all over the world. Nutritional additives they developed have allowed countless babies to benefit from the same fatty acids found in breast milk that help encourage mental and visual development and are now found in hundreds of products and almost all baby formula. Radical Islam ... Long before the Cold War ended, cosmonauts and astronauts were shaking hands 144 miles above the world. Travelers from 14 countries have visited the ISS. NASA has worked with Pakistani scientists and engineers. Tracking of storms and floods have saved many lives in Pakistan, India, Afghanistan, and other nations. Peaceful cooperation is one of the founding mandates of NASA's mission. And stupidity ... The money that was spent on science and engineering during the Apollo era inspired such an increase in studying that it led to several generations of American supremacy, all because of our advanced technical capacity. An advantage that is rapidly slipping away, as NASA remains stuck idling in LEO and following the unambitious program that we pay for today. Even if all we got out of the Apollo program was the beginnings of the integrated circuit (which wasn't the case, by the way) it was still one of the greatest technical achievements in human history. Money spent on science is never wasted. We simply can't afford to fall behind. Do you think that all the brilliant engineers and scientists who have been employed by NASA would have just wound up as farmers and truck drivers if NASA didn't exist? Nobody ever said money spent on science is wasted. Try opening your mind a bit. Zoom out just a little, to use the vernacular. You may be amazed by what you appear to be unwilling to see. Do you feel the need to attack anyone who you even remotely feel is contradicting or disagreeing with you? Jayman419 was pointing out where NASA's research and development DIRECTLY affected modern lives. You are pointing out alternatives to NASA engineering and research. In reality you are both agreeing that science, almost all science, is good and benefits mankind across the globe. Where you disagree is in the minutia. Jayman feels that this type of program is a good investment because the technology developments would further advance the state of the world. You state that this program is a bad investment because the money spent on it could be used to research new technologies to further advance the state of the world. So in reality all you are arguing about is HOW to invest the money in these advancements, not that they need to be made. Jayman and Alice- i think you are both smarter than I am. Both of your points are very good. I must say I learn more from the post than I do from the actual article. Alice and Kanageloa, I think you miss an important point. Space exploration is worthwhile not just because of all the advances in science and technology it produces for all of us. It also has the virtue that projects like this, which have long timescales, longer than any one life, are a reminder that there will be a future, and that it can and should be wonderful. I believe this is a motivator to deal with other challenging scientific, engineering, and social problems, which, like space exploration seem daunting and doomed to failure and arouse the cynics in each of us. Moreover, taking on new explorations and trying to examine new vistas inspires and excites those children who will grow up to become the next generation of scientists and innovators. I think this phenomenon of space exploration alone more than makes up for the dollars spent sending people and probes to the planets. Ask engineers and scientists of the 1970s and 1980s and you will see that Apollo inspired a great many of them, many of whom went on to conquer problems in other fields – computing, chemistry, medicine, genetics, ecology, materials sciences, and the likes. Finally, and perhaps most importantly, if all scientific research were applied, gravitation would never have been understood, which would never have led Newton to the crucial link between mathematics and physics. All of the early physical revolutions were in response to scientific observations of useless phenomenon, places hundreds of years away, much like the places you are describing today. Science often progresses by looking in places we might not choose to concentrate our interest, because those areas shake up our understanding and force us to challenge our beliefs. Well, I think this is terrific. It's really great that we've solved all our little hunger and disease and war and education and religious fanaticism problems here on Earth and have all this extra money just lying around that we can send off to other planets. It's just "super" that uneducated people like you who use the Internet can't even fathom a project in space that help to create the Internet/modern computers to begin with (Apollo etc.). The $$$ is NOT sent into space. It is spent right here on planet Earth employing hundreds if not thousands of tech workers and related fields. $$$ spent on exploring space pushes technology to its limits – helping everyone on Earth. It's called an investment – which short-sighted people like you and politicians seem to quickly forget. It's also very nice how you presume that anyone who disagrees with you is ignorant. You're like a Genius or something. I bet you own an iPhone, don't you? How did you decide what my level of education is? Did I say anything about sending a suitcase full of cash into space? No, I did not. But if you think the money and resources are all staying here on Earth – you're voluntarily stupid. They are definitely talking about sending something real into space. And that something costs a lot of money to produce and launch. By your reasoning, you probably justify all the crimes of the Inquisition as "Look at how much knowledge we gained in the fields of medicine and carpentry by building all those wonderful torture devices." I am saying that is a relatively pointless endeavor that isn't going to help anybody who is currently suffering at the hands of pompous asses like yourself. And in case you don't realize it. Science and engineering are going to progress quite nicely right here on Earth without wasting millions of dollars sailing a boat on a lake on another planet. You got yourself an extremely little mind there. Oh, and did you mean "helped", Mr. Educated? The space program accelerates technical developments, helping us push ourselves faster and further than we were previously capable of going. And the spin-offs benefit everyone, all over the world. Because of that, NASA inspires people. And the scientific returns are well worth the half a penny of every tax dollar that the government invests in NASA. It's an indisputable fact... NASA's programs act as a crucible for talent, drawing the best and brightest from around the world to work together to solve incredibly difficult problems. People go into scientific fields to accomplish great things. They do the dreary, boring work of counting buttons and polishing beakers while dreaming of doing the awesome. Oh, and for the record, Ms. Educated, this isn't even a NASA program. It's a proposal for ESA to consider. So, there's that, too. "You got yourself an extremely little mind there." Who cares Alice, it's not your money to tell them what to do with it. Invest your own money however you want, let them do as they please. indisputable ? Once you decide that it's over, eh? I do know who the 14 year old girl was. That's why I made the comparison to the fascist mentality that shot her for disagreeing with them. And, I did read the article. I never once said it was a NASA project. I knew it was European. I never suggested science isn't worthwhile. I just said certain types of projects seem wasteful of resources when there's so much suffering going on. Regardless of how little the millions are in comparison to the whole... I would bet the hungry and the lame would think the amount was huge. So, that's where I will leave it. At your closed door. There has been, and always will be, suffering in the world. Investing in space exploration is not going to have any effect on this. Striking down this idea only because you would want to put resources (albeit incompatible resources – scientists, chemists, engineers, etc. are trained to do these things, not solve all of humankind's suffering) towards your 'areas of concern' is actually fairly close-minded in itself. You think that scientists, chemists, engineers, etc. are incompatible with reducing the problems of hunger, disease, and the poorly educated? Once again, I never said all science is bad. Hell, I never said the entire space program is bad. I said projects like this one seem pointless. And you ran with it. Holy hell, did you ever run with it. Realize this: we're not spending a lot on these projects in comparison. As stated by others, NASA's budget isn't even at 1% of federal spending. Besides, your arguments are off topic. When we choose to fund NASA, it's not a difference between life and death. And if anything, it isn't pointless. It expands our knowledge of the universe, which in turn helps us. Yes, it may not help our current problems. But scientific research doesn't affect our ability to help the world in any negative way. I'm not going to try to force you to believe anything. You think what you want. The problems you are concerned with are not solved by throwing money at them. People can support scientific progress and social progress. Why not decry campaign finance and all the money used to elect people. That money is pretty much wasted. These kinds of projects gives us many jobs and boosts the economy.The space program has also given us many of the things we use and take for granite today. It is not a waste of time or money.. I'm glad you find yourself fit to judge what a private company does with it's money. Believe me, it is no better in Europe or anywhere else. Awesome, I hope the funding and approval works out. How cool is this idea! I hope they get approved and funded. No wind or some kind of atmospheric force that could be used? R E A L L Y ? WHY? Thats all we need is BP screwing up the rest of the solar system. Then we will learn the real meaning of an alien invasion. Seriously, Einstein? You actually think flying gas from Saturn is going to be economical? Comedy gold. Hey has a point though. Private firms will no doubt seek to mine the most precious minerals in space. Relatively it may prove to be a slightly more expensive endeavor than mining earth but there are known plus sides. For example, waste disposal not an issue; they have the entire solar system. Any of earths most rare or energy creating elements found in abundance in space could very well pay for itself many times over. Where there is money, there is a will, and where there is a will, there is a way. We could build a pipeline through the nature preserves on Mars! There would be no bad consequences whatsoever in bringing a moonful of gas back, we'd have free gas forever! Plus, global warming is a hoax, and if it is real, I don't mind the weather being a little warmer. Where's the harm in that?? Get my TAN on! Liquid hydrocarbons? For Gods sake don't anyone tell Enbridge! I hope I am around when this happens. That would be very, very cool. I love science. Tea Party Taliban would prefer you "love" creationism and ignore science. I'd love to see a vessel sailing on a liquid hydrocarbon lake. A Currier and Ives print for space nerds like myself. They'll find ET on vacation. This is a great idea and would be extremely exciting. They probably won't find much but the images from the lake alone would be worth the trip. And there will be some long term scientific value. This would be great! Exciting science! I hope they get it approved. I'm gonna send a probe to Uranus tonight. What a jerk. You are too stupid to be commenting on a science story. is the probe a small little mushroom like stick? Must be quite small coming from you.